With Captain David Gold and an away team trapped on the other side of an interdimensional rift, Lieutenant Commander Kieran Duffy Þnds himself in command of the U.S.S. da Vinci just as the ship comes under attack by the Tholians. The enemy is armed with a new and improved version of their infamous energy web, and the da Vinci is badly outnumbered, but þeeing the battle means abandoning the captain and the others to an uncertain fate outside this universe. There, marooned aboard a derelict vessel, Gold and his S.C.E. team struggle to keep the madness -- inducing effect of the rift from driving them to suicide and murder before they can Þnd a way to escape the realm of Interphase. The exciting conclusion of an all-new two-part adventure! On more than one occasion, mostly during the early years of her career, Commander Sonya Gomez had experienced feelings of helplessness in the midst of a crisis. As she stood on the bridge of the U.S.S. Defiant and studied the surreal image displayed on its main viewer, such feelings once again taunted her and dared her to submit to their stifling embrace. 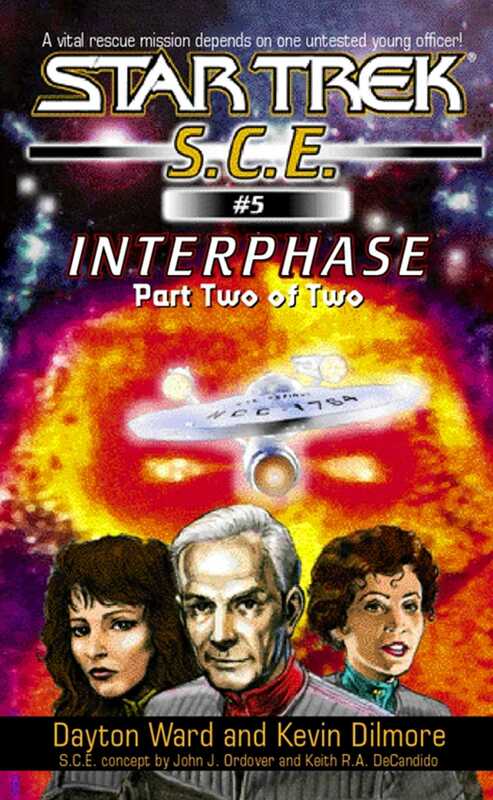 Along with Captain David Gold and Soloman, she watched as the interdimensional rift continued to mend itself, sealing the Defiant inside this pocket of chaos ambiguously known as "interphase" and separating them from the U.S.S. da Vinci and their entire universe. At the moment, helplessness seemed almost appropriate. The mission, like so many others Gomez had undertaken since joining the Starfleet Corps of Engineers, had started out easily enough. Daunting and compelling from both technical and historical perspectives, the task of retrieving the Defiant had energized the entire da Vinci crew, from Captain Gold on down. The recovery of the fabled ship, lost for more than a century after becoming trapped in an interspatial pocket connecting this universe with another, presented a unique engineering challenge. When the ship disappeared in 2268, most scientific minds throughout the Federation believed that it had been lost in the other universe with no hope of being recovered. That belief had held true until two weeks ago, when a Tholian vessel had discovered the Defiant, still trapped in the interdimensional rift but now visible again for the first time in more than a century. The circumstances leading to the ship's reappearance after so long remained a mystery and the Tholians, in their typical fashion, had not been forthcoming with any potentially helpful information. And we could sure use that info now, Gomez mused. She had led an away team to the Defiant with the task of restoring minimal power to the derelict vessel. Working with Kieran Duffy, the da Vinci's propulsion specialist, she had decided that the Defiant's maneuvering thrusters could be used to help extract the ship from the rift, with the help of the da Vinci's tractor beam. Duffy and his team had also modified the ship's navigational deflector to stabilize the Defiant's hull and make it easier for the tractor beam to lock onto the trapped ship. Of course, it wouldn't have been an S.C.E. mission if the Defiant hadn't yielded a few surprises of its own. First had been the condition of the ship itself. Drained of power, the Defiant was a lifeless hulk, dark and foreboding as the away team materialized in the depths of its engineering section. Then there were the remains of the ship's crew, drifting free throughout the vessel's interior in the absence of gravity. The nightmarish scene had caught Gomez off guard and caused her no small amount of anxiety. Her reaction to the situation troubled her, but she had managed to keep her unease at bay to this point by concentrating on the tasks at hand. But then the Tholians had inexplicably fired on the Defiant, disrupting the da Vinci's attempt to pull the century-old ship from the interspatial void and instead throwing the Defiant back into the rift. The action had the further effect of collapsing the pocket around the ship, trapping it and the da Vinci away team within the confines of interspace. "The weapons fire could have disturbed the fabric of space near the rift," Gomez said as she studied the century-old viewscreen. "The area is already so unstable, any kind of disruption would probably be enough to affect it." Turning away from the viewscreen, Gold said, "Something similar was reported in the old Enterprise logs when they discovered the Defiant. It had the effect of throwing off the interphase timetable. The Defiant still continued to appear and reappear, but they had to recalculate the intervals." "That means the da Vinci can probably still get us out," Gomez said. "Maybe," Gold replied as he stepped toward the starboard side of the command well. "But first we need to make sure the ship won't fall apart around us." He turned his attention to the science station. "Soloman, do we have internal sensors? Can you give us a damage report?" The Bynar keyed commands to the science console as his face was bathed in the soft blue light of the station's viewfinder. Several moments passed as he reviewed the information supplied by the Defiant's limited sensors. "There are...hull breaches on decks eight, thirteen and...fifteen," he reported. "There is also some buckling...in the port warp nacelle." As he turned away from the viewfinder, the Bynar added, "The damage is minor, given the...intensity of the attack, Captain. We were...most fortunate." Gomez sighed in relief. "I'll say. If that's the extent of the damage, then we should be okay even under the pull of the da Vinci's tractor beam." "If she's still there," Gold said, drawing shocked expressions from Gomez and Soloman. The da Vinci's commanding officer didn't acknowledge the looks, however, instead adding, "She may have been disabled or destroyed by the Tholians, or Mr. Duffy has obeyed my orders and taken her out of the area. Either way, we may not be able to rely on the da Vinci to get us out of here." "Even if the rift was open," Gomez said, "the Defiant's maneuvering thrusters aren't enough to push us out on their own." The generators they had brought with them from the da Vinci would never be enough to power the ship's massive impulse engines, to say nothing about the warp drive. Gold shrugged. "Then we'll just have to find another way, won't we?" "Captain," Gomez said, "what if we do get out? The Tholians could be waiting on the other side of the rift for us. We'd be sitting ducks." "Given a choice between waiting here for who knows what to happen or taking our chances in normal space," Gold replied, "I choose the latter option." The chirp of his suit communicator interrupted their conversation; it was followed by the voice of Dr. Elizabeth Lense, the da Vinci's chief medical officer. "Lense to Captain Gold. I have an emergency situation and require assistance." "Doctor?" Gold called out, his voice rising a notch. "Are you all right? What about Pattie?" Shortly after beaming to the Defiant, P8 Blue, the S.C.E. team's resident Nasat engineer, had detected an odd power source emanating from deep within the ship. Gold had sent her and Dr. Lense to investigate, and they had found a strange device of Tholian design stored in one of the ship's cargo holds. To the best of Gold's knowledge, Pattie and Lense had remained down there during the Tholian attack. He had sudden visions of the pair caught in a maelstrom of cargo containers and equipment tumbling about the cargo hold free from the restraints of gravity, and Pattie and Lense frantically seeking cover from the potentially lethal assault. "I am uninjured," Lense replied to the captain, miraculously maintaining her composed tone of voice, "but we are not in the cargo bay. During the attack, a section of the hull destabilized and Pattie fell out into space. As she was already unconscious, I had no choice but to follow." "What?" Gold said. "You mean you're drifting in space outside the ship?" "No, sir. I managed to get us back, but by then the hull had solidified again. I am standing on the exterior of the ship, and I can find no sign of an airlock or other entry point. Pattie has sustained a concussion. She needs medical treatment, and I have to get her helmet off." Gold looked to Gomez. "Transporters? Can we beam her directly to the bridge?" The engineer shook her head. "There's no power to the transporters, sir, and no way to remote control them from up here. Someone would have to be in the transporter room on deck seven." Gold turned to the science station to find Soloman already working at the sensor controls. He didn't have to wait long before the Bynar looked up. "I have located them, Captain. The closest entrance to...the ship is a maintenance airlock on the...starboard side of deck fourteen. I can direct her to that location...from here, but the hatch will have to be opened manually." Lense's voice carried a note of concern. "I'm not sure if I can do that by myself and take care of Pattie at the same time." "I can meet her there, Captain," Gomez said. "Soloman can give me directions to the hatch, and I'll get there through the Jefferies tubes." She knew that navigating the crawlspaces and maintenance throughways connecting nearly every point on the starship would be difficult while wearing her environment suit, but that would be offset somewhat by the absence of the ship's artificial gravity field. "Sounds like a plan," Gold said, nodding his approval. "In the meantime, Soloman and I are going to do some more detective work. It's pretty obvious that whatever set the Tholians off has something to do with that little tchotchke that Pattie and the doctor found in the cargo bay."